When the harvest is and for how long – the season ending before you finish your 88 days will only incur extra costs and time. If you are planning ahead it would be good to find out which part of the season is the best. We have been picking oranges so this involved ladders and stretching. Although the trees were a lot taller than I imagined I was glad it wasn’t bending over my back would not have survived 88 days of that. Heading to the East Coast of Australia? This post is full of places to stop and things to do while there. You are living, working and relaxing with this person, that’s 24 hours 7 days a week for 13 weeks. It is going to test your friendship. Still having said that I would still recommend going with someone doing this own your own would be insanely tough. I went with my boyfriend and you can read his take on our time fruit picking here. We chose a working hostel or more to the point the MRQ boat hostel. It’s had huge ups and downs along the way as it has only been going 6 months, but the social side has made this whole fruit picking part bearable. Just be aware a working hostel won’t be the cheapest option for saving money. On a working holiday visa in Australia? I’ve got all the tips for you here. Our boss was a crazy (in a good way), 60 something Cambodian lady who on day 2 man handled me on to her tractor and drove us across dirt tracks whilst being perched only on the edge. Still we worked hard and she began to like us so much so she learnt my name before anyone else and when the farmers went on strike she got us extra hourly paid work. We went wrong on this one and ended up doing by the bin. Over the 10 days where we did have an hourly paid job we nearly earnt as much as the rest of the time picking. When you earn $25 a bin and a bin takes two people over an hour to pick the hourly rate is shocking. Not really thinking about the time of year or the temperature of an Australian summer having never experienced one before this was an error on our part which resulted in picking oranges in 40 degree heat most days. Need ideas for jobs in Australia? This post is full of ideas for you. Even up until the day we left we were having scares from Chinese whispers that we wouldn’t get signed off or that if we were investigated it wouldn’t stand up to immigration. Its good to know beforehand if they sign 7 days a week or how many you work. No one knew where they stood on our farm as some got everyday others got just the days they had worked – which in many peoples case that wasn’t a huge amount. Our first day I was convinced they must have a tap and a porta loo but no. You need to take enough water and food to last all day. And if you need to relieve yourself its behind the orange trees. Before we arrived we were told to wear long sleeves – I thought that was silly, I wanted a tan! But the orange trees have thorns and your skin will get cut to pieces otherwise. Problem is in 40 degree heat I found it too hot for long sleeves needless to say my arms are covered in cuts. Make sure you wear gloves at all times. I also found boots helpful. 10. If you are booking with a company make sure you research them. We found the job on Gumtree but it was with a company called Harvest Hoppers. They have several staff whose job it is to recruit people to their working hostels. During the time on the phone with one of these members of staff we were promised something completely different than we got – the biggest problem of this was she promised we would earn money easily the reality was not. There were also several times during our time in the hostel where they sent too many people on board and they didn’t have enough jobs for any of them. They seem to have good ideas for the company but I would warn you to be careful. Want to read some more stories of my orange picking adventures, you can find some here. 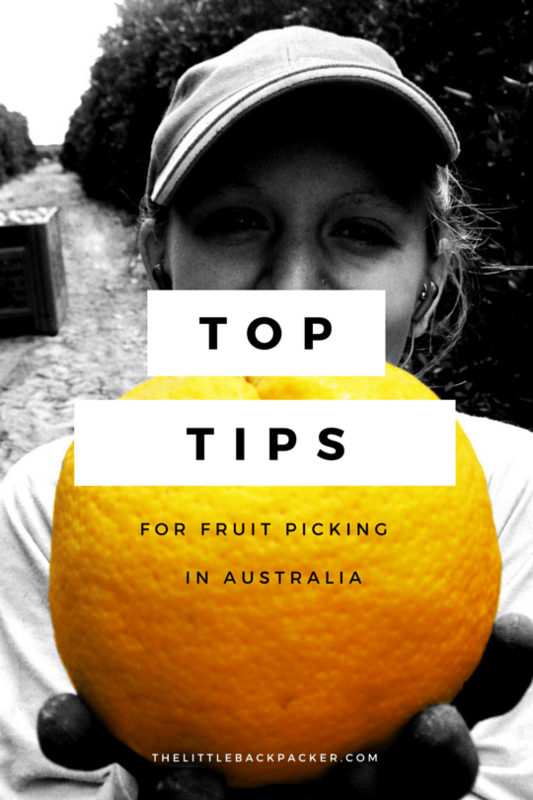 Have you been fruit picking in Australia? What would your top tip be? Yes, I’ve heard some are very good I just wouldn’t recommend the one I went to. Hey, where did you do your 3 month regional work? do you have contact details? thanks. Hey Callum. I would not recommend the farm I worked on, the pay was bad and the work insanely hard. The company i used harvest hoppers have other farms and I’ve heard the one near airlie beach is good. Hope that helps you. I’m going Mildura with harvest hoppers and haven’t got much money is this the right thing to do can you let me know ASAP please???? Each farm is different in pay and rent, but if it isn’t paid by the hour then you are in for a lot of hard work to warn money! I’m sure you can make some money if you are picking in the Winter season, I was there in the SUMMER season and despite being a VERY hard worker with very little breaks and hours and hours of slaving away sometimes the heat is just too much to handle. But yes if you do take a ton of breaks don’t expect to make money! my friend has just left to do this and I was thinking of doing the same but i just wanted to ask a quick question. How much did you make on average a week? The hostel is like $170 p/w so after tax, food and rent did you have much left to save? He is staying on the murray river queen too, and booked through 2ndyearvisajobs.com which I think is the same as harvest hoppers. I also want to book through 2ndyearvisajobs.com is it any good or not? Great and informative article, thanks! Heya, I did orange picking (and stayed at the MRQ) from Jun to Sept 2013. After slaving away with shite money for 3 months and applying for me visa I got turned DOWN from immigration saying I hadn’t worked long enough days. I was lucky with work, working 5/6 hrs a day every day for the period. I’m appealing the decision through the MRT (migration review tribunal) and I’m attending a hearing next month to argue my case. After speaking with people who’ve picked at varying times through the year – the general opinion is everyone does these length days. Immigration says you have to work a “standard length day for the industry” for your days to count. Would you know of any website that gives a “standard length day” for fruit picking. Cos I cant ind any. Any help/advice much appreciated. And there was also a contract saying that I have to stay for 3 months there to get the 2nd visa signed off (I don’t really plan to stay that long since I still have 9 months to go and I think I can work in different farms to collect the days, right?). The contract said if I leave early, only the days but not the weeks will be counted for.. So did you heard of anyone on the boat not staying for the whole period of 3 months but still got the days counted? I just feel quite unsure about this hostel and just don’t wanna repeat my past bad experience in another working hostel I stayed… So your advice will be much appreciated. Thanks a lot! That all sounds very true to the Murray Reiner queen. The farmers themselves would refuse to sign off people that left early or didn’t return – instead the hostel managed to persuade the farmers to sign off the actual days. I stayed for the full three months and got signed off no problem. However yes you should be able to work at different farms. I would say the mrq will be okay if you like drinking, partying and are single. But it was never guaranteed work, the rent was expensive and management unprofessional. Good luck with your decision and feel free to email more any more info/advice. My mate and I are planning on getting a work visa next year and doing a few months of fruit picking from September to December, in order to get some money saved before we go to the big cities and find jobs there (just to make sure we have enough money in case it takes long to find a job). And so, I was wondering how much you were saving per week working in a farm, more or less (after-tax and paying for the costs of living). Also, did you sleep in a tent, and where would you get/cook your food? Just wondering if you have to work 3 months in a row or can do a month here and there, totaling 3 months, to qualify for 2nd year working visa? It doesn’t have to be in a row, as long as you have the three months it’s fine. NOTE: if you work somewhere for 3 months, working 5 out of 7 days you will probably get signed off for all seven days but if you only work somewhere for a month then you are more likely to only be signed off for the five days you actually worked meaning it will take more than three months to get all the days you need. Ok, thanks for that. It’s hard to find the right info about fruit picking!…One other thing, I won’t be able to complete 3 months before turning 31. I’ve been told that as long as I start working before turning 31, I’ll still be eligible for 2nd year visa. Do you know if this is correct or anywhere I can find out? Hi jodie, can I ask you something? Regarding the bin of orange picked, is the bin shared with others? Like you and your boyfriend together picking one bin of orange per hour. If both of you picked total of 4 bins, the pay total is $100? or each person get $100? Ivan, it will all depend on the farm itself but from my experience the price was paid per a bin no matter how many people helped to pick it or how long it took. So if you picked 4 bins between two people you would be paid $100 in total. I have one more question, are the people working there wearing sunglasses all time? Hey jodie I am going to salis farm. He says he will pay me 300 for a row. Is this a good deal? How much time does a full row takes? Can I do it in 8 hours? Please confirm. It completely depends on the fruit and the farm. Some days my boyfriend and I were able to pick a whole row in a day other times it would take us a whole week to pick a row. There really is that much variability. Hi Vince. Sorry but I don’t have any contact details. regards. I have just had a job offer to work on a farm picking watermelons in Mildura. its $21/hour, accommodated by an Inn, daily hours 8-10. She wants me to start working in two days – I only applied for it today. Are there any precautions you would recommend to take before making any snap decisions? Watermelons is a ground job so will involve a lot of bending over – would be cautions if you have ever suffered from a bad back. If you can find any reviews of others working on the same farm that may help your decision. Otherwise being paid by the hour is a great deal and I would say to snap the job up. How much do you have to pay for accomodation and food? Is accomodation ever included in any of these fruit pick-up contract deal with farms? If not (as expected), can accomodation be easily found in the same regional areas? Hi Carla, the answers to your questions are very different for every farm and job. Some will have accommodation that you pay for while many that offer free accommodation and food won’t offer a wage for the work. Again the amount you save really depends on how much you can earn a week. Sorry I can’t be of more help, I just know every situation is so different. Pingback: 5 backpacking safety tips for travellers visiting Australia - How to do everything! Thanks for the article, out of left, do u know about picking blueberries? My boyfriend and I are currently in South Australia working. There is a local backpackers hostel that we have heard many stories about, both good and bad, mostly bad. We really lucked out by going off the beaten path and getting a job directly with a winery off winejobs.com. We found this route much better because people who went to the backpackers hostel were considered expendable, where as if you are signing up for a specific job the businesses are more willing to invest in you. Harvest here starts around the end of January and cellar hands generally get paid $21-$23 an hour starting off. You will get overtime but be prepared to work hard and get dirty. Really dirty lol. Hi Morgan, does this work still count towards your 2nd year visa?